3 year old boy tops the scales at 132 pounds. Home Scandal and Gossip 3 year old boy tops the scales at 132 pounds. Abnormal hormones or just too finger licking good? 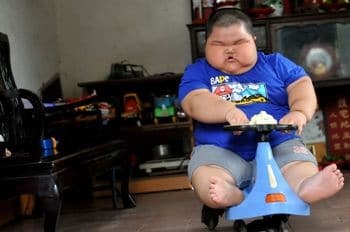 Lu Hao by any stretch of the imagination is like most 3 year old boys, but unlike most 3 year olds he also has a voracious appetite, an appetite that currently has him weighing in at 132 pounds. 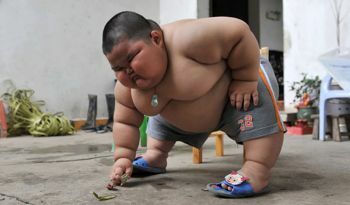 A weight which sees him weighing 5 times the weight of boys his age…. 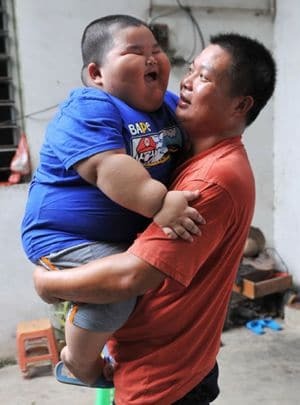 thesun.co.uk: He is getting so big his family are frightened of him — and have given up trying to stop the youngster from gorging on huge plates of ribs and rice. 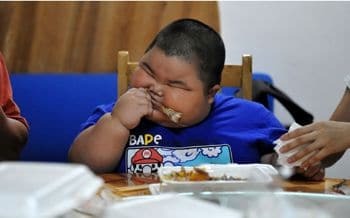 His parents claim he throws vicious tantrums if he doesn’t get third or fourth helpings of dinner. Vicious temper tantrums? Which presupposes when Lu Hao is in the mood for a snack, it’s best to understand it’s just the 3 year old boy’s special way of letting you know he knows best. Despite his parents attempts to put their 3 year old on diets (they have all failed-he has instead put on an extra 1 and half stone) their son now has found himself banned from nursery school for fears he may, ahem, crush the other children. But surely a trip to the doctors is a must? Last year Lu Hao’s worried parents took him to see specialists at the Guangdong Children’s Hospital. Doctors there said they think it is possible his weight gain could be down to a hormone disorder. Dr Lu Hong said at the time: “He is not just overweight but very tall as well so we may be able to treat him if it really is hormonal.